It's different this time for the U.S. Federal Reserve, as it moves to raise interest rates for the first time in nearly a decade. The last time Fed decided to hike interest rates was in June 2006, but the balance sheet of the Fed looked quite different at that time. A possible Fed rate hike comes this week after nearly a decade of no increases and is being received with mixed reactions across the nation. June 2006 was before quantitative easing. In 2009, the Fed increased the money supply in the markets and push down borrowing costs to stimulate the slowing economy by buying billions of dollars of bonds, expanding its balance sheet from $869 billion in August 2007 to more than $4 trillion after the 2007-2009 financial crisis. The current size of the balance sheet of the Federal Reserve is $4.5 trillion. But the current challenge the central bank faces is that it needs to push interest rates up without disturbing the financial mix on its balance sheet or reducing the levels of reserves held by banks immediately. Global central banks need to look at new monetary tools (keeping big balance sheets or using negative interest rates to combat shocks), since low interest rate is becoming a more permanent component across the global economies, said San Francisco Fed President John Williams at a conference at University of California Berkeley's Clausen Center. The new tools to raise interest rates were mentioned in a Semi-Annual Monetary Policy Report in February 2015 by the Fed chief Janet Yellen. She had said that the central bank intends to achieve its target range for the federal-funds rate "not by actively managing the Federal Reserve's balance sheet" but through an increase in "the rate of interest paid on excess reserves" in addition to controlling rates through "overnight reverse repurchase agreement facility" and "other supplementary tools." As the financial conditions get better, these tools will phase out gradually over a period of time. 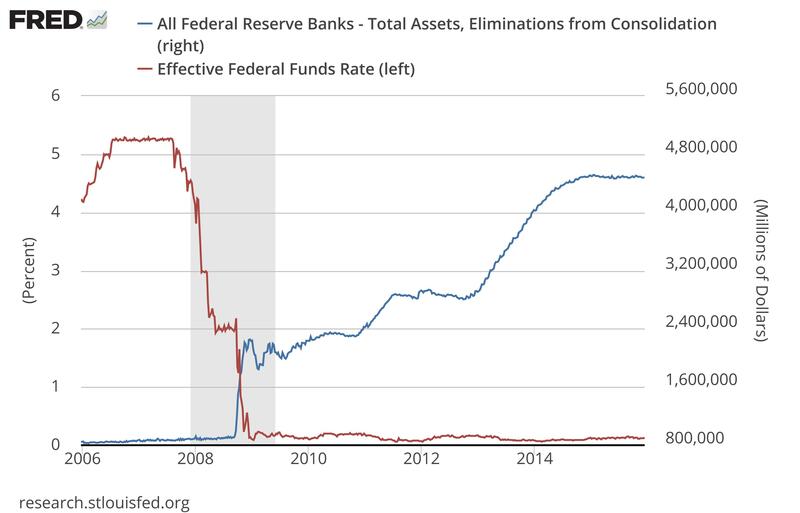 The rate of interest it pays on the banks' reserves it holds: instead of adjusting quantity of reserves, the Fed will increase the interest rates it pays on the banks' reserves. This will act as a ceiling. According to Financial Times, the Fed will start to shrink its balance sheet in a "gradual and predictable" manner only after it has first increased the short interest rates. In the past, many central banks across the globe have used monetary policies to keep a check on their domestic economies. Central banks of many economies across the world tried to raise their interest rates only to lower them later, according to The Wall Street Journal. Central banks in Sweden, Israel, Canada, South Korea, Australia, and Chile have seen their economies fall once they tried to raise the interest rates. The Fed rate hike comes after nearly a decade is a more complicated and a cautious move, with inflation rates remaining well below the target rate of 2% for three years. Adding to the complication further, the global economic environment has not been very stable either. The uncertainties in emerging markets have been another major concern throughout the second half of 2015, with special worries around China, falling oil prices and a strong dollar. The Fed's first-rate hike after a decade will show exactly how far the economy has come and test whether the markets can embrace this positive news without any financial glitches.